Hi, it’s Pete again from Northside Automotive, and I’m here to give you a heads-up about the road safety rules in Queensland regarding cyclists and driving around them. I’m sure we all know what it feels like to be stuck behind a slow cyclist when you’re running late or trying to drive somewhere quickly. Sometimes it’s tempting to honk the car horn at them or to accelerate and overtake them quickly so that you can continue on your way. But did you know that there are rules for both cyclists and drivers that, if you were to break them, could result in a heavy fine? Thankfully, I’m here to tell you what you need to do to avoid getting in trouble and more importantly, to make sure that everyone is safe on the roads. Did you know that cyclists riding on Queensland roads actually have to obey all the same road rules as drivers? And this is in addition to a heap of other rules that can be found here: https://www.qld.gov.au/transport/safety/rules/wheeled-devices/bicycle. Bicycle riders who break the law receive the same fines as motorists, so keep that in mind next time you’re tempted to get aggressive towards a cyclist. For now, let’s focus in on 7 simple rules that outline what you need to do as a driver when it comes to sharing the road with cyclists. When you’re overtaking a cyclist, you must give them a minimum of 1 metre of space, if the speed limit is 60km/hour or under. If the speed limit is over 60km/hour, you must give the cyclist 1.5 metres. Keep in mind that these distances always apply, even if the cyclist is going around an obstacle. To pass a cyclist, if it is safe to do so, you are allowed to do the following: drive over the centre lines in a 2-way road (including double unbroken lines); straddle or cross a lane line (including a continuous line) on a multi-lane road; and drive over a painted island. Drivers must indicate when passing a cyclist if the car changes its position on the road. Firstly, indicate right for long enough to warn other road users that you are about to overtake the cyclist, and secondly, indicate left when you have passed the cyclist and are returning to your original position. If you want to pass two cyclists who are riding next to each other, the minimum distances apply to the cyclist on the right. And if you think it’s annoying when bike riders do this, keep in mind that it is legal for cyclists to ride side-by-side on the road, as long as they aren’t more than 1.5 metres apart. Always check your blind spots – cyclists are smaller than other cars, and so be extra careful when changing lanes, opening your car door, or turning. 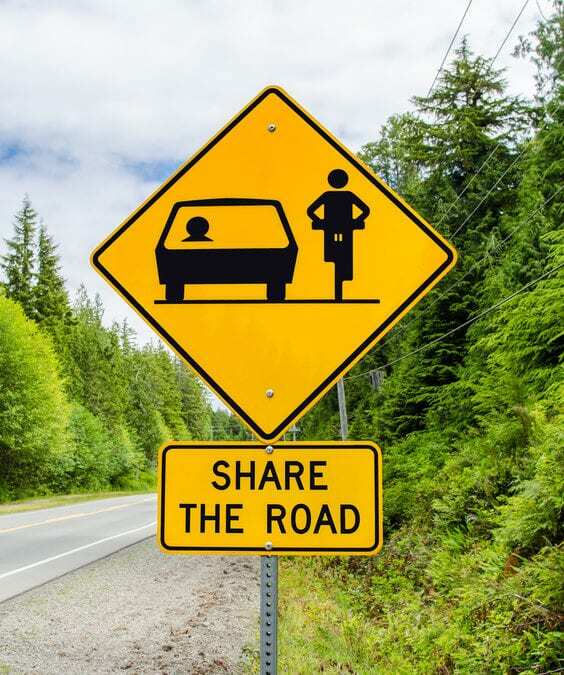 Treat cyclists the same way you would treat any other vehicle on the road – give way to them when required, and drive behind them at a safe distance. If a cyclist is ahead of you, and you need to turn left, you must wait until they have crossed the intersection, or let them turn ahead of you. Overtaking the cyclist and cutting them off is extremely dangerous. It’s very important to be cautious when driving near cyclists, and to remain patient and considerate when overtaking. Remember that by waiting until it’s safe to overtake, you are potentially saving lives. And if that’s not enough for you, keep in mind that not allowing the minimum distance when you overtake will result in a $378 fine and the loss of three demerit points. If the matter goes to court, a maximum fine of $5000 can apply. So stay safe, stay patient, and happy driving!